I love this shirt,... such cute colours and amazingly soft fabric. Last time I wore it though, was two years ago. Ooops! And this skirt above is yet another one of my new season purchases from ZARA, along with the carrot pants. Got it in black too! It's gonna be a real workhorse for my work wardrobe. And those sandals... Seriously, these are the most comfortable heels ever! I'm really regretting that I didn't buy them in black as well when I had the chance. The belt came free with the skirt. 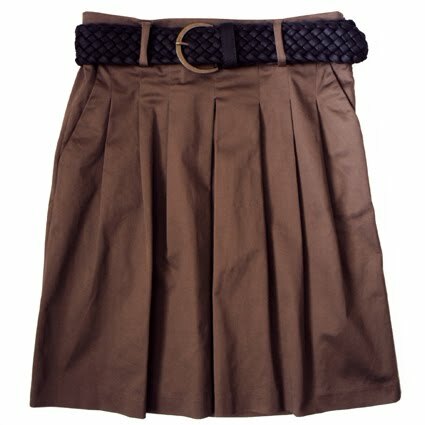 I love the dark brown colour and the woven style, but I'm not very keen on fake leather... It makes it really hard to slip through the belt loops and it just frustrates me when I get dressed in the morning and my hand-eye coordination isn't at its functional best. But until I decide which one of my belt collection is best suited for this skirt, it will have to do. Stripy button-down shirt, Mango. Camel skirt and its own belt, ZARA. Cream sandals, Clarks. I loved those carrot pants - I'm going to trak them down over here! They will be just what I need for work! To poukamiso moiazei ligo andriko kai m aresei para poly!Na ypothesw pws den apousiazes apo to FNO? Perimenw yliko! εγω παλι φετος περναω φαση αρνησης και δεν αποδεχομαι πια το γεγονος οτι πρεπει να εχω αλλα ρουχα για τη δουλεια και αλλα για τη καθημερινοτητα μου! ειμαι σοβαρα αραγε? You look so well put together. Those sandals so do not look like Clarks. Nice find! I have the same impression with Antoinette. I always associated Clarks with something less elegant. You should, those pants are them best thing ever! I know! For me, Clarks fall into the same category as Camper and Wonders: Most styles verge on fugly, but there is a small percentage that are actually cute and presentable. Bonus fact, they're always comfy as hell! very classy lopi, perfect for work. oh and thanks for the tips on washing silk! you're right, it wouldn't be much of a bargain if I don't wear it! well...what can i say...it looks great on you!! Very classy outfit! love it. i got inspired as to what to wear to work on Monday.Thanks.